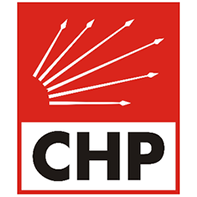 Established by Mustafa Kemal Atatürk on September 9, 1923, just before the proclamation of the Republic, the Republican People’s Party (CHP) embraces Kemalist and social democratic ideologies and follows a center-left political line. It is currently the main opposition party in Turkey. The CHP evolved from the majority cadres (First Group) of the first Turkish Grand National Assembly that fought the War of Liberation. It ruled uninterruptedly from 1923 to 1950, and through a single-party rule until 1946 with the exception of short pauses in between. It has the longest stay in power as a political party in Turkey. It was initially established as the People’s Party and renamed itself in 1935. After four years of coalition governments that followed the coup of 1960, it underwent a policy change in the mid-1960's and rebranded itself "left of the middle." Although the party had won two elections in 1973 and 1977 under Bülent Ecevit's chairmanship, it was able to found three short lived coalitions due to a polarizing political environment. Closed after the 1980 coup, the political line represented by CHP split into two, represented by the SHP and DSP. CHP was re-established in 1992 and united with the SHP in 1995, but former chairman Ecevit's DSP was the larger party of the center left until 2002, when the CHP returned to parliament as one of the two parties that passed the national threshold, the main party of the center-left and the main opposition. Its emblem is six white arrows on a red background, which symbolizes the early single-party principles of republicanism, statism, populism, laicism, reformism and nationalism.